We wanted to create an Iceland tour that will take our guests to the furthest reaches of this wondrous country. A tour that brings our guests to the less traveled parts of Iceland, where photo opportunities are endless, and the crowds disappear over the horizon. A rugged oasis of celestial waterfalls, hidden volcanoes, volcanic black-sand beaches, steaming geysers, ice-blue lagoons, glacial lakes and the famed Northern Lights, you go to Iceland not knowing what to expect, but always come back changed. Join our team in Iceland and together we will capture the most breathtaking photographs in some of the most remote areas Iceland has to offer. Our loose itinerary will bring us to the northern reaches of the ring road, free to roam and explore the diverse landscapes, while our local expert, guide and driver makes traveling decisions based on the ever-changing weather patterns, insuring us the best shooting conditions possible. If you’re anything like us, there will be times on your journey when you’ll wonder if you’re even still on planet Earth at all. In Iceland, magic isn’t the question; it’s whether there’s ever enough time to soak it all in. Of course, you will be exploring the remote parts of Iceland while working elbow-to-elbow with our professional photographers. With the freedom to explore and shoot what you want, you will learn new techniques and ways to approach your subject, all while mastering the technical aspects of your gear. This once-in-a-lifetime experience will take our intimate group around the ring road of Iceland, delivering photographic opportunities reserved for only the true diehards. No articles or photographs can prepare you for the range of experiences you will encounter during our tour. Ice caves and waterfalls, cliffs teaming with puffins, black volcanic beaches, Icelandic horses, hot springs, moss-covered lava fields and so much more. This tour, like each Discovery Photo Tour, is designed around intimate and exploratory experiences with guidance and lessons from our team. To ensure our guests experience the magic we intend, we only allow 6-8 participants to join us on this small group tour. If you’re looking for the ultimate photography experience, reserve your seat before they are all gone. During our journey through Iceland, we’ll get a taste of the Nordic lifestyle and immerse ourselves in a country alive with everything from live music, and visual art, to traditional Icelandic cuisine like skyr, smoked lamb hangikjöt, kleinur, bollur and more. Fusing an eco-friendly mindset with the country’s decidedly eclectic style, Iceland pulls you in and doesn’t let you go. It’s a destination inspiration seekers have longed begged to see for centuries. If you have yet to see the ethereal Jökulsárlón lagoon in all its natural glory, this is when you will. In rugged Iceland, there are awe-inspiring vistas everywhere you turn; and each is as jaw-dropping as the next. Photography locations are our bread and butter, it’s where our tours really shine. Join us on our Iceland adventure, and by our first photo op, you’ll see what we mean. In a mystical part of the world even the most avid travelers yearn to see, we’ve taken all the guesswork out of how and when to capture the magic. We’ll have an unforgettable photography experience from the moment the tour begins; capturing everything from the volcanic, black sand beaches of Jokulsarlon to Kirkjufell’s flowing waterfalls, Jökulsárlón’s breathtaking glaciers, adorable Vik and more. Discovery Photo Tours works with some of the most talented and experienced professional photographers in the business. Our goal is to provide you the opportunity to travel alongside and work elbow to elbow with internationally acclaimed photographers who will help you capture the incredible beauty our destinations offer. Whether you’re new to photography or a professional looking to expand your portfolio, our tour leaders will share invaluable techniques, knowledge and experience gained over the course of their careers. Photography aside, we expect you’ll have the time of your life on our tours. Traveling the road with us means there will be lots of laughs, interesting stories and delicious meals where you’ll be treated like family and will leave with new life long friends. Take your time, today, if you have it. Our group will be flying into Reykjavik all day long – so if you’re one of the earlier arrivals, use your free day to explore the world’s most northern capital. There’s so much to see in Reykjavík. Spend an afternoon taking in the eclectic, colorful buildings, cool cafés and wayward vibes of quirky Reykjavík, catch one of its popular music festivals or concerts, explore Old Reykjavík, the historic center, or grab a pint with one of the locals – the conversations you’ll have with the creative souls who live there are sure to pique your interest. Our group will meet for dinner and kick off our journey with a celebratory feast. On our first full day of shooting, we will gaze upon endless fields of moss-covered lava rock that spans as far as the eye can see and get our closest look yet at the gargantuan glacier Vatnajökull. Next on our list is the intimidating Reynisfjara black stone beach at Vík í Mýrdal which makes for some dramatic imagery along with the basalt columns and spectacularly shaped basalt sea stacks, Reynisdrangar. We'll also get the opportunity to visit two of Iceland's most iconic waterfalls; Skogafoss and Seljalandsfoss! The southern coast of Iceland is truly a natural marvel with so many incredible and varied sights to behold and photograph. We’ll visit Skaftafell Nature Reserve and explore the beautiful Vatnajökull glacier and Svartifoss waterfall before heading to he famed Jokulsarlon Glacial Lagoon and Diamond Beach. Truly a photographer’s dream come true, this unique part of the country will never appear the same way twice as the ever changing ice formations clave from Europe’s largest glacier, into the frozen lagoon until they make their way to the Atlantic. The ferocious ocean is not the final destination for many of the icebergs of all sizes. 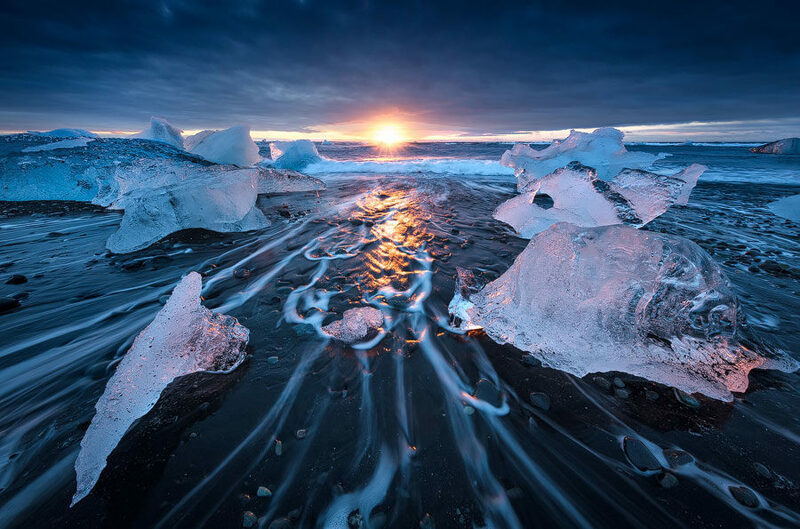 Many end up littered on the black volcanic sand beaches nearby and those frosty sculptures make for incredible subject matter for our intrepid photographers. Be prepared to be blown away with your visit to an incredible sight that ew get the chance to see. The crystal blue ice caves in Iceland under the Vatnajökull glacier are tens of thousands of years old and one of the true treasures that you’ll never forget when looking back at your time in Iceland. But wait… there’s more! On any of the nights we are likely to witness the spectacular aurora borealis as they dance in the northern sky as if the Norse gods were waging a war fought with the most beautiful swirling green fire you could imagine. On days 3, 4, and 5 we let mother nature decide for us where we end up and we have some wonderful choices to select from. Glaciers, seascapes, and waterfalls are all on the list and the crowning moment is when we arrive at Vestrahorn. If mountains could be supermodels, this would be Iceland's top model for a mountain. No two days are alike in terms of the weather next to this sea side peak. Fog, mist, cloud, and clear blue skies are all possible here and all within the span of an hour. We’ll also make several attempts at getting the perfect shots at Jokulsarlon including at sunset with magical golden light. Today, our intrepid group heads to the eastern shores of the island nation to explore the lesser known regions of the country. We will travel through the winding roads that take us to the fjords as we head to the largest settlement in East Iceland, Egilsstaðir. Keep your fingers crossed for northern lights as we’ll have a perfect opportunity to capture them over the lake Lagarfljót or from Iceland’s largest forest, Hallormsstaðaskógur. Keep your eyes peeled while at the lake as it is not uncommon for visitors to make sightings of the fabled Lagarfljót wyrm, a legendary lake monster; records of which date back to the 13th Century. Let’s treat ourselves to something special today and spend part of our time relaxing at the famous Mývatn Nature Baths. Let your troubles slip away as you enter the hot spring’s 38°c waters. 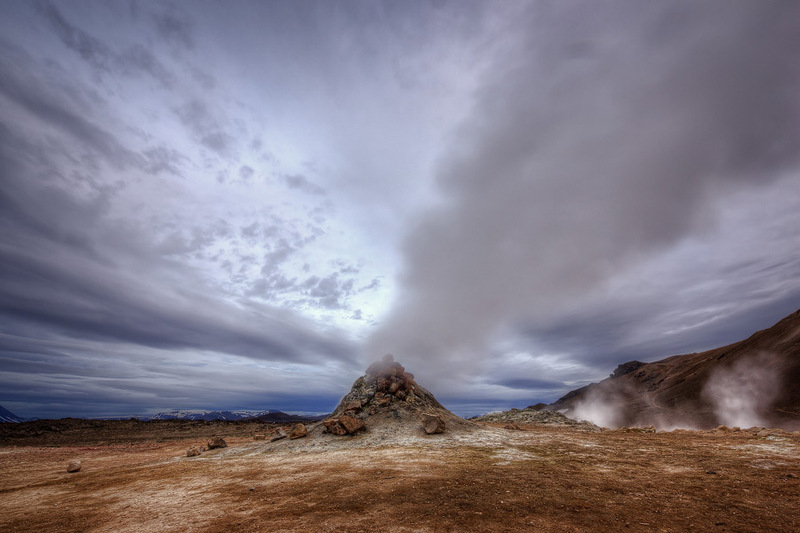 If that isn’t enough heat for you, we have you covered as you can also partake in the steam baths powered by a geothermal vent that forces natural steam up through holes in the floor. Have no fear, we haven't forgotten about photography! Amongst the photo ops of the day are three more spectacular waterfalls—Dettifoss, Selfoss, and Hafragilsfoss—await along with other-worldly sulphur vents that will truly make you believe you have traveled to a distant planet. Continuing our exploration of the spectacular other-worldly landscapes around the Lake Mývatn, we will seek out some of the more bizarre scenes Iceland has to offer like moss covered lava rock, giant basalt stacks that rise from the ocean and insane thermal sulphur vents. If you’re a Game of Thrones fan, be sure to keep a lookout for some of the shoot locations from that epic television series. Yup… shot right here in Northern Iceland! On the last day of our time in the Mývatn Region we hit two of our favourite waterfalls in Iceland and for a country that has thousands of waterfalls, that’s saying something! We travel the the Diamond Circle route, to get the opportunity to photograph Goðafoss and Aldeyjarfoss. May we suggest that you hold on to your socks? They may just be blown off by the pure awesomeness of these two extraordinary waterfalls. On the last day of our time in the Mývatn Region we hit two of our favourite waterfalls in Iceland and for a country that has thousands of waterfalls, that’s saying something! We travel the Diamond Circle route, to get the opportunity to photograph Goðafoss and Aldeyjarfoss. May we suggest that you hold on to your socks? They may just be blown off by the pure awesomeness of these two extraordinary waterfalls. After breakfast at our hotel our group will depart to the airport to catch their flights home or perhaps extend their stay in Reykjavik and explore the beautiful city. We hope you can join us again in another remote region of our beautiful planet.